Technically a little challenging the first few times you make these, but well worth the effort, these little pancake balls are super delicious and fun to make. 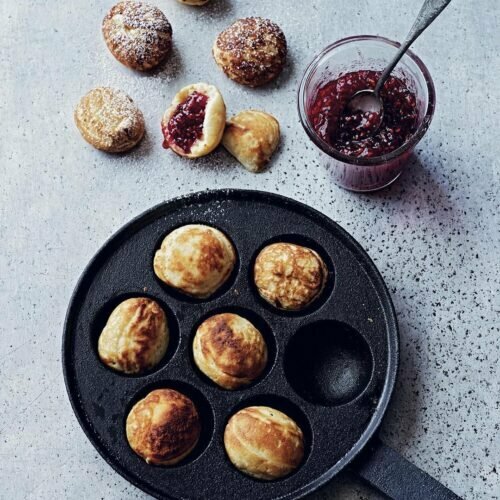 Danes love eating Æbleskiver on Sundays in advent and all through December - this recipe is from Bronte Aurell's cookbook 'Fika & Hygge' (Alternatively, we stock ready made ones in the cafe during Christmas season, so pop by and grab a bag or two). You can vary your pancake balls as you see fit - we've made them with saffron, chocolate sauce, savoury (Noma famously used to make one with a little fish sticking out of them)... But these are the most traditional version. You need: an 'æbleskive' pan Japanese takoyaki pan. If you use a frying pan, they will look like mini pancakes instead. You can get basic pans on Amazon. Mix together the egg yolks, buttermilk, double cream and vanilla extract in a large mixing bowl. In a separate bowl, sift together all the dry ingredients including the cardamom. In another clean bowl, whisk the egg whites until stiff using a handheld electric whisk on high speed. Add the egg and cream mixture to the dry ingredients, then carefully fold in the beaten egg whites and lemon zest. Leave to rest for 30 minutes in the refrigerator before using. Place the pan over high heat to warm through and add a little melted butter to the pan to stop the pancakes from sticking. If you are using an æbleskive pan, carefully add enough batter to each hole so that it reaches about 0.25 cm from the top. If you are using a normal frying pan, add spoonfuls of batter as you would if making normal small pancakes. Leave to cook for a few minutes until the edges become firm then, using a fork or knitting needle (knitting needle is easier! ), gently turn the pancakes over to cook on the other side. If you have filled the holes too much, this can be tricky – you’ll get the hang of it after a few. 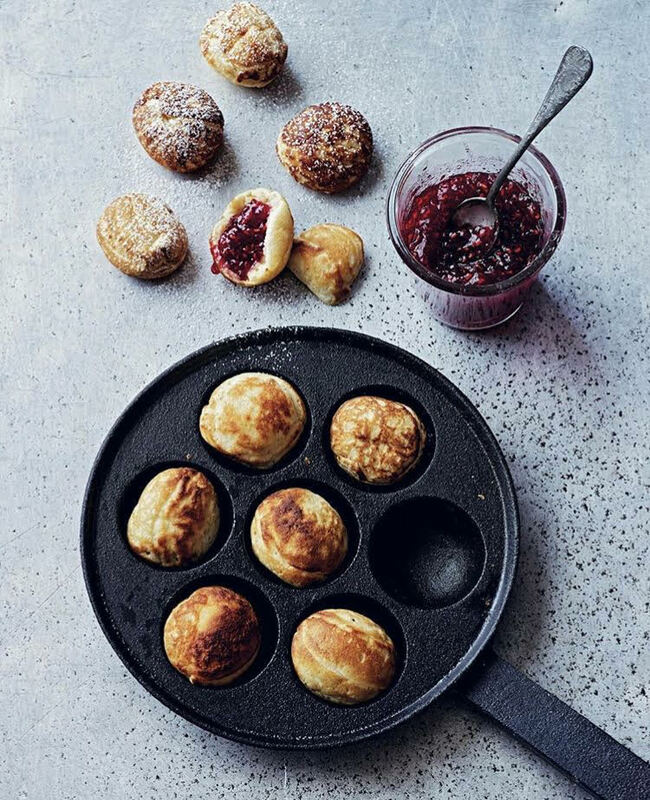 Once browned on both sides (3–4 minutes per batch), keep the cooked æbleskiver warm in the oven until you have finished frying. Serve dusted with icing sugar and a little pot of raspberry jam for dipping. Recipe from Fika & Hygge published by Ryland Peters Small - priced £16.99. Photo by the amazing @PeteCassidy.